Software size, the amount of functionality in a given software release, is arguably the most critical of the five core metrics of software estimation. There is little point in tracking effort, duration, productivity and quality if you are unable to quantify what you are building. Yet, despite its critical importance, software sizing is often a difficult concept for many to understand and use properly in the estimation process. 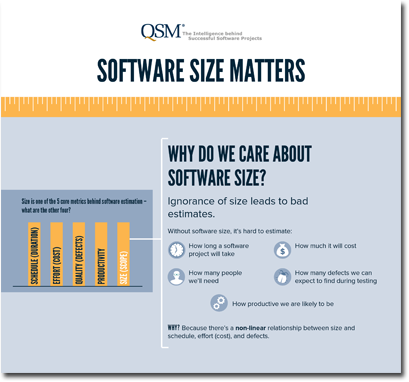 In this webinar, Joe Madden will give an overview of QSM's Software Size Matters Infographic, which addresses the challenges of measuring software size and identifies the most popular sizing methods and when to use them. With over 17 years of software sizing experience, Joe will provide case studies and best practices for real world application.